Hex-Beam (Hexagonal beam) antenna is a nice and compact multi-band antenna. It is easy to construct, requires less space for deployment and yet provides good performance. Hex-beams can be designed in two different variants. The first is the classical Hex-beam which has two mirrored W-shaped elements per band. It features good gain at nominal bandwidths. Other variant is a broadband version featuring a W-shaped radiator and a open D-shaped reflector. This one has slightly lower gain. On HamSphere 4.0, we do not need broadband characteristics. Hence we chose to implement the classical Hex-beam configuration. This antenna for Hamsphere is a six band version covering 40-30-20-17-15-10m. The height above ground has been optimized to give fairly good DX coverage along with suitability for short/medium range operation on all supported bands. HamSphere Hex-beam is an excellent cost effective multi-band antenna and has been created to give very good value for money. Those graduating from the IDC or G5RV to rotatable antennas will find it appealing. Other more experienced operators will also find the Hex-beam to be quite useful under various propagation conditions. 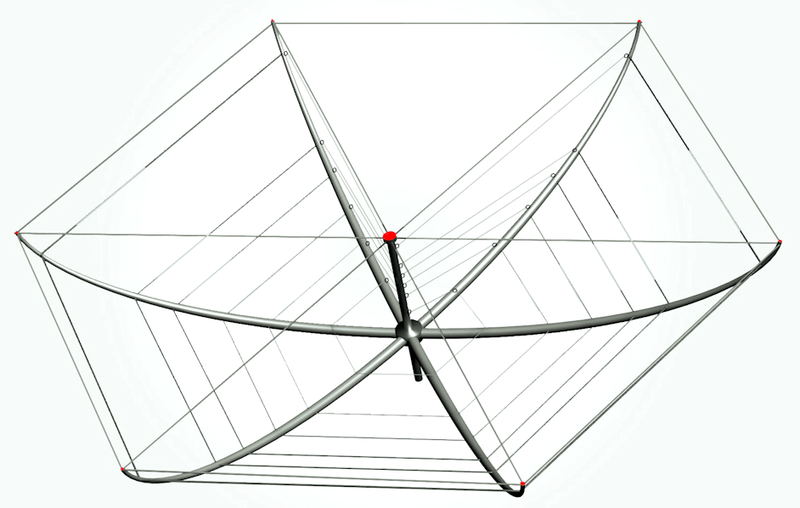 HamSphere Hex-beam antenna is meant to fill an existing gap in our range of multi-banders. With the SSN progressively displaying a downward trend at this point in solar cycle, lower frequency bands are becoming exceedingly important. The bands like 30m and 40m are becoming more relevant for DX. Hence, the Hex-beam fills the gap in our arsenal of multi-band antennas by coving these bands. Last but not the least, the Hex-beam features a very broad frontal azimuth beamwidth. The F/B ratio is also not high. Hence stations calling from the back side will also be discernable on this antenna. Please see the specifications below.